The Short Version: Relationship Hero has a growing list of experts on hand to help when seas get choppy. With no appointment needed and coaches available 24/7, the company provides instant advice (for an affordable per-minute charge) for any dating and relationship problem. Experts have extensive counseling backgrounds and go through a rigorous training program, so they’re well-prepared for whatever aid you may seek. Modern technology has added many conveniences to dating and relationships. A click or tap can provide numerous tools that make it easier to chat, send photos, or make dinner plans with someone no matter where they are. But that level of access isn’t always a good thing. A major component in building or maintaining any relationship is communication — saying the right thing at the right time. You don’t want to sound indifferent or come off as desperate. If you’ve ever counted the minutes while waiting for a response to a text, you know what I mean. That first exchange of texts or emails is a fine line many daters trip over, and some never regain their footing. The internet is filled with advice on how to dress and act or what color flowers to give on a first date. If you want your relationship to outlive those flowers, though, you need a hero on your side. Lior Gotesman founded Relationship Hero with a mission to quickly and efficiently help struggling singles and couples. Relationship Hero aims to help its clients navigate the rushing waters of dating and relationships with solid advice delivered by trained experts. This isn’t your typical Silicon Valley offering, with auto-response chatbots churning out prewritten answers to popular questions. These are real, breathing humans with experiences and expertise to share that makes it easier to overcome any dating obstacles you may have. Aside from dating and relationship advice, Relationship Hero specializes in guidance on family issues or workplace etiquette. Lior has reason to be confident about the training his experts receive because he literally wrote the training materials. His interaction with relationship and social coaching not only earned him the right to train others, but it gained him some training of his own. Text messaging — as well-intended a technology as it is — can kill even the strongest relationship. It’s hard to tell the mood and context of what you write since it’s delivered without tone. Even the happiest of emoticons can come off as sarcasm if the recipient is having a bad day. Lior’s team of experts act as objective outside consultants who don’t take sides. The group helps users over the phone or through private online chats to get to the root cause of whatever is troubling you. Relationship Hero experts are available around the clock to lend a hand to people seeking help in their social lives. Through the Live Advice link on the company website, you can choose an available counselor from a list, or one can be assigned to you based on your situation. In addition to successfully completing Lior’s comprehensive and ongoing training program, Relationship Hero coaches, counselors, and therapists come from an array of backgrounds in the field. Some hold degrees in psychology or boast years of professional relationship coaching experience, or are active in prominent relationship advice communities. The combined experience works to the advantage of every client who’s looking for solutions. Relationship Hero’s team of experts complete an extensive training program before provide guidance to clients. 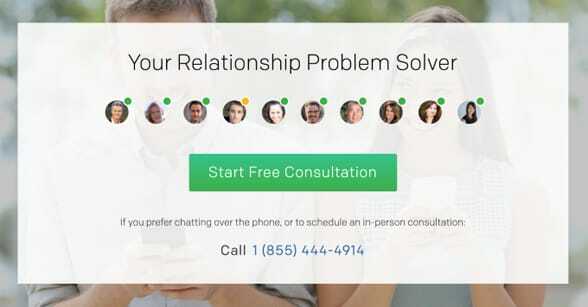 With 30 million people seeking therapy every year, Relationship Hero provides users with simple solutions to everyday problems through instant contact to someone ready to help. 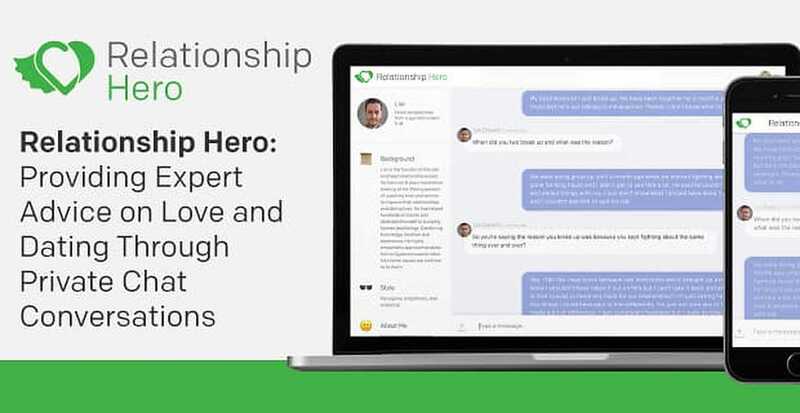 Advice through Relationship Hero is both instant and affordable. The company charges by the minute with each new client receiving 10 free minutes to test the service out. After the trial, charges cap at $1 per minute. A 100% money-back guarantee is available for up to 30 minutes of charges if clients are not completely satisfied with the service they receive. Relationship Hero offers advice to people all over the world regardless of their background, relationship status, gender, sexual orientation, age, or religion. Lior said his client base represents an array of ages , as noted by a 65-year-old woman he recently helped reunite with an ex-boyfriend. The service is open to anyone 18 years or older. 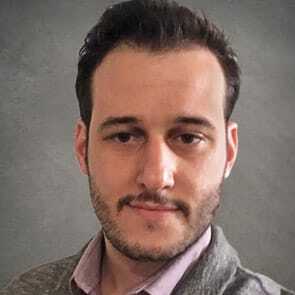 Lior said his office has a board where employees share success stories from clients who once struggled but now thrive in their relationships and dating. It’s never too early, or too late, to improve your social skills. Every relationship, whether measured in days or decades, is a practice in patience and understanding. Things are always being tweaked and improved upon to make life and love a happy experience for everyone involved. It’s part of what makes a relationship both wonderful and work at the same time. If you’re in a relationship or seeking someone to call your own, it’s important to have an outside party to talk to when times get hard or confusing. Appointments with dating coaches or counselors can take weeks or months to take place. Most relationship difficulties can’t be put on hold that long. Relationship Hero offers instant access to capable experts trained in the field of relationship and dating advice. Training is extensive and comprehensive and aims to make every client’s experience smooth and successful. With a list of counselors available at any time, day or night, Relationship Hero is truly like a sidekick in your social life that is ready to lend a hand when needed — with no cape or mask required. Ray FitzGerald is a Contributing Editor at DatingAdvice.com. More than two decades after he started dating his eventual wife, he's seen enough peaks and valleys in a relationship to write a book. Instead, he chooses to share his insights and experiences with readers of DatingAdvice.com. Ray has a background in journalism and a writing portfolio that covers an array of topics, and, in his spare time, he enjoys classic movies and basketball.